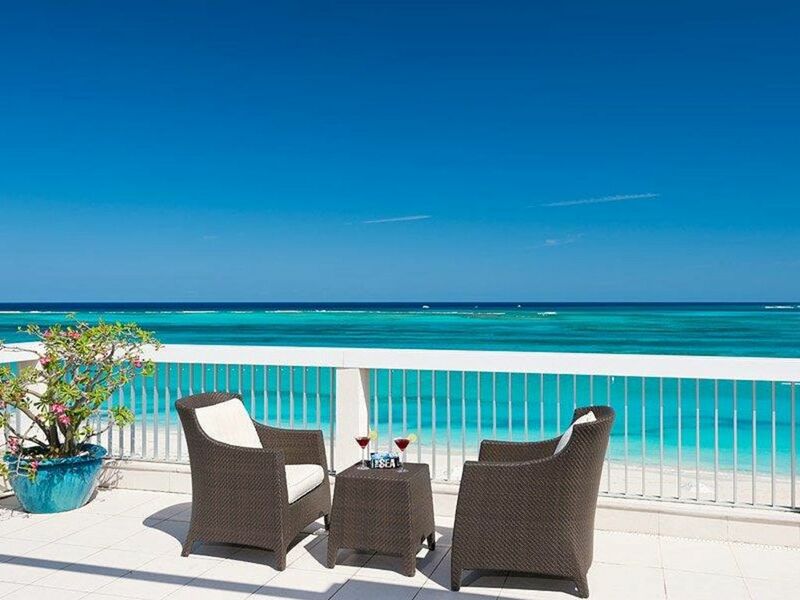 Occupying the entire top floor, this Penthouse combines luxurious living with an unequaled panoramic view of the top rated beach in the world... Grace Bay Beach! This incredible 3 bedroom Penthouse Suite spans the entire top floor of one beachfront building, which is very rare on the island. All bedrooms have views of the ocean and sliding glass doors to the wrap around deck. Over 4000 sq. ft. offers plenty of room to spread out and enjoy both the sunrise and sunset. From the moment you walk in and see the breathtaking views from this 5th floor masterpiece, you know you are someplace special. Whether you prefer to be under roof, under the pergola, or bathed in tropical sunlight or moonlight, this penthouse suite provides all options.This is modern architecture with a European flair at its finest, right in the heart of Grace Bay. This location on Grace Bay Beach offers many options within walking distance, from fine dining to beach bars and the main shopping area. Relax on the balcony, take in a sunset, entertain, relax in the infinity pool, or walk to the nearby restaurants and shops. Busy executive searching for the perfect getaway. Perfect location, great views from each room, and expansive balcony. In addition to drip coffee maker, there is an espresso machine. Infinity pool shared with a few condos. Typically feels private. Beautifully appointed. Views and location were excellent. Pictures represent accurately. We had a wonderful time. Three mature well traveled couples thoroughly enjoyed our stay at this beautiful condo. The beach and pool we’re immaculate. Wouldn’t change a thing. Hope to return again. We thoroughly enjoyed our stay here in the Provo Penthouse. It had everything we needed and then some! We loved the wrap around patio and were impressed with all the nice outdoor furniture to enjoy. The kitchen had everything we needed. Le Vele is in a fantastic location within walking distance to some of the best restaurants and shopping on the island. The beach out front is one of the quietest locations on Grace Bay Beach... so peaceful! There were always chairs and umbrellas set up for us each day. Camilla and Ches were so helpful throughout the process of booking the condo and during our stay. I cannot recommend this place enough!! We will be back next year. We stayed in the penthouse and had an amazing view of Grace Bay! We had 3 couples and plenty of room! The staff is wonderful! We will certainly be back! Unit was beautiful and perfectly appointed with everything one would need. Chez and Margaret easy to deal with and accommodating. Getting into the unit upon arrival was as simple as stopping in the office. View was spectacular. Lanai spanned the entire front of the unit and wrapped around both sides. All bedrooms had access to the lanai. There is always part of the lanai in both sun and shade depending on your preference. The condo location within Grace Bay is, at least in my opinion, about as good as it could be. Nice shops, cafes, and bars within close walking distance. We will be back. Travel hint: Groceries and booze expensive...and I have a high threshold for "expensive". Pack your own coffee, whiskey, wine, nuts, snacks, etc. Unit has drip coffee maker and separate espresso machine. Thank you for your review Nathan. We hope to host you again and hope you enjoyed your stay! Incredible Penthouse and Vacation Location! We have stayed at many condominiums but the Penthouse East at Le Vele was by far the best. The condo is elegantly furnished and well equipped with comfortable beds, fully stocked kitchen and many items for pool and oceanside activities. It’s location on Grace Bay Beach and proximity to restaurants and shopping was outstanding. The 5th floor penthouse was perfect for our stay with every room having amazing views of the beach and ocean. The property itself was very quiet but in close walking distance to restaurants, shopping and bars. In the evening, we would sit on the deck which wraps around the penthouse and watch dolphins swim along the beach and see breathtaking sunsets. We were able to ride bicycles, included with the condo, to a nearby beach which was ideally suited for Kite Boarding given its sandy beach bottom which extended over 1000’ into the ocean while maintain a depth of 2’ to 3’. The very friendly staff helped us schedule Kite Boarding lessons and after a few days we were able to enjoy the sport given the excellent lessons and ideal beach. We were also able to experience excellent scuba diving during our stay. It was only about a 5 minute ride to the dive boat and the reef and wall diving were the best I have experienced. We are looking forward to returning soon. Thank you for your review Richard. We hope to host you again! The penthouse east at Le Vele was a perfect place for our family (4 adults and a 2 year old)! The beach was perfect, the toys for our son to make ocean soup and sand castles were great. The kitchen was awesome and fully stocked with all of the cooking stuff you could imagine plus a great selection of storage containers for leftovers! Graceway grocery is a quick drive or 15 minute walk (super easy and safe walk right through the heart of grace bay). The grocery store is amazing for this small of an island, great produce and all of the familiar items for a repeat cooker like myself:). Rent a car! The island is super easy to navigate and fun to drive around. Taylor bay is really cool especially for little kids! 1 foot of water for about 100 ft out into the bay. Camilla was a really friendly and communicative owner and took time to ensure our stay was as expected. We have been all over the Caribbean and this was by far the best beach, water and accommodation we have found! Thank you for your review Matt. We know family is an important part of enjoying vacation and are glad your kids enjoyed the toys we provided. Thank you for your stay. We would love to host you again. Within a short walk to the Salt Mills shopping area, which included restaurants, boutique shopping, and grocery store. We are directly on the beach in a wonderful locations that is quiet, yet close to amenities. Unlike many resorts, there are no back to back chairs on the beach. So relax and enjoy! Other Activities: Kite Boarding, scuba diving, para-sailing, deep sea fishing, bone-fishing, tennis, golf, snorkeling. Golf: Top ten golf course in the Caribbean. Please see renter agreement for further details. We DO NOT include a service fee. Check within the small print and you will find at 10% service fee added to the price on other properties. This never felt right to us - we DO NOT add additional charges.